Here’s a craft that is fun to do, recycles empty cereal boxes, and organizes those stacks of magazines, paperback books and miscellaneous papers around the house or in your child’s bedroom. Cereal boxes may seem a bit flimsy, but once filled with magazines or books, they are just fine. This craft project is great for family, classroom or group craft time. Ahead of time, paint (and maybe cut) an empty cereal box for each person and gather everything needed for decorating the boxes. Turn everyone loose to create nifty magazine holders. Read through the project and gather the materials needed for creating magazine holders from recycled cereal boxes. 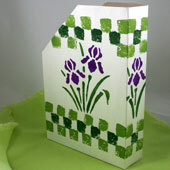 If you are doing this craft with a group, precutting the boxes and painting them white will make the craft go faster. Tip: Cereal boxes and magazines come in a variety of sizes. Before starting the project, be sure your cereal box will hold the magazines or books you plan to store in them. Also check the height of your bookshelf—cut the box shorter, if needed. Cut the top flaps off the empty cereal box. Use pencil and ruler to draw a line from the middle of the box’s top to one side at a 45-degree angle, straight across the side, and up the back at the same angle. Cut on this line. Lightly sand the outside of the cereal box to dull the shiny coating. The paint will adhere to the box better if it is sanded first. Spray the box with white paint, or apply white paint with a sponge brush. Let paint dry. Two or more coats may be needed to over the bright printing on most cereal boxes. The box is now like a blank canvas ready for your creative ideas. 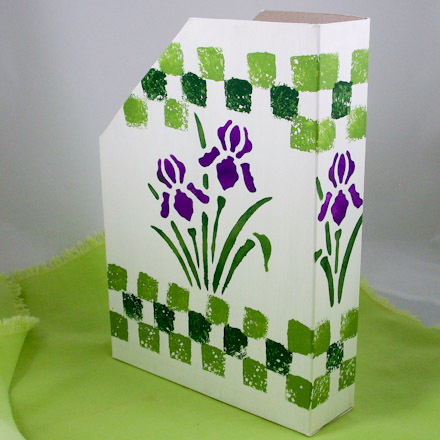 Paint the box with sponges and stencils, or use any decorative technique you know to create a unique box. 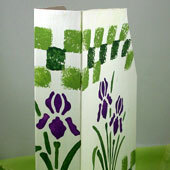 To decorate a box like the example magazine holder, cut a small square sponge stamp from an ordinary kitchen sponge and sponge-stamp a border of checks in one or two colors of green. Follow the instructions in the Sponge Stamps and Art project. 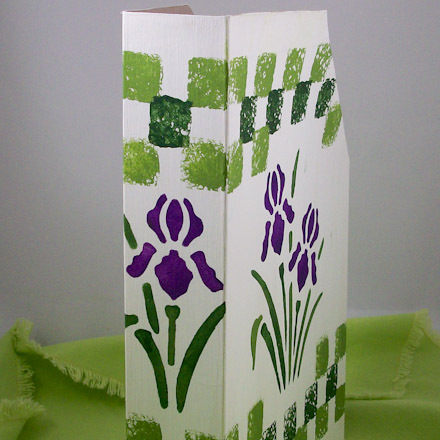 Next, stencil in greens and purples using an iris stencil on the box's sides and ends following the Stenciling Basics instructions in the Stenciled Greeting Card tutorial. Tip: Almost any decorating technique can be used on these boxes. You might cover a box in fabric that matches your decor. Or paint a scene across several boxes with a circus, Old West, or ocean theme. How about gluing pictures cut from old magazines to the box, and then applying several coats of a decoupage sealer? Or just paint the box a solid color and let kids paint, stamp, and glue their own creations. That's it! Your magazine holder is complete! Thanks to Valerie J., who submitted the ideas for this craft project to Aunt Annie's Craft Exchange in 1996. Valerie shared, "I like to do crafts with items found around the house. I am a graphic designer and find crafts to be a great creative outlet." Tip: It's fun to decorate all sides of the magazine holder; however, if you plan to shelve it on a bookcase, only the end facing out will show. 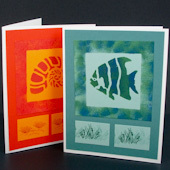 Related craft: Use stencils and sponging to make Stenciled Greeting Cards. 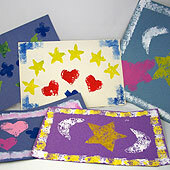 Related craft: Turn the kids loose making and using Sponge Stamps cut from ordinary kitchen sponges.